The MLB Postseason means that once again Fox and Turner will share the heavy lifting, with ESPN and MLB Network making special guest appearances. It also means the annual haunting of America by Atlanta Braves analyst Joe Simpson, who has once again been assigned to one National League Division Series this year. 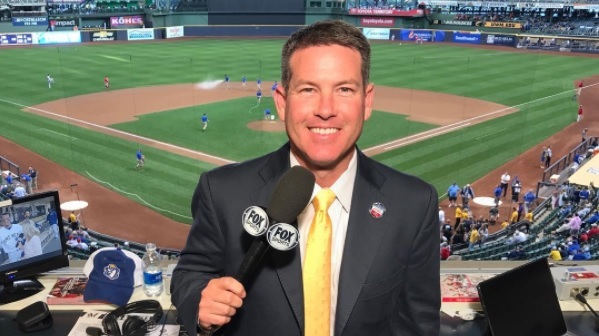 However, the main takeaway is that Brian Anderson will not only call one NLDS, but will also be calling the National League Championship Series. Ernie Johnson, who is normally the MLB on TBS “A” announcer, will be on NBA on TNT duty to the early start of the regular season. For the National League Wild Card Game on Tuesday, TBS will have Johnson alongside Ron Darling and reporter Sam Ryan calling Colorado at Arizona. Game time will be at 8 p.m. ET. That trio will also call the NLDS matchup between the Chicago Cubs and Washington Nationals. Meanwhile, Anderson will be teamed with analysts Dennis Eckersley and Simpson, and reporter Lauren Shehadi for the series between the Rockies/D-Backs Wild Card winner and the Los Angeles Dodgers. For the NLCS, Anderson will be teamed with Darling and Ryan. For the MLB on TBS studio show, Casey Stern returns as the host and he’ll be joined by a trio of returning analysts in Pedro Martinez, Gary Sheffield, and Jimmy Rollins. While TBS only has 13 regular season games, the main reason for its contract with MLB is for October. It pulls out the stops, knowing that fans will be paying attention to its coverage. TBS’s NLDS coverage begins Friday with its pregame show at 7 p.m. ET, followed by Cubs-Nats at 7:30 p.m and the Dodgers hosting the Wild Card winner at 10:30 p.m., meaning that it will (unsurprisingly) be a late night for baseball fans. On Saturday, Game 2 of the Cubs-Nats series will start at 5:30 p.m, and the Arizona/Colorado-Los Angeles Game 2 will begin at 9:00 p.m.
Our full MLB Postseason broadcast primer will be posted tomorrow.